Box set containing the first five films. Wrong Turn is a series of six American slasher horror films created by Alan B. McElroy. All six films focus on various families of deformed cannibals who hunt a group of people in West Virginia by killing them all for food in horrific ways by using a mixture of traps and weaponry. Of the three main cannibals in the series, only Three Finger has appeared in all six films. 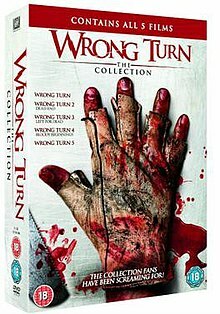 The original Wrong Turn film was released in 2003, and is later followed by two sequels and three stand-alone prequels to the original film, that lasted up until 2014. In the first film, a group of six friends are stalked by One Eye, Saw Tooth and Three Finger. Chris Flynn (Desmond Harrington) is forced to make a detour after a chemical spill on the road. He makes a wrong turn and crashes into another vehicle which had already fallen victim to one of the family's road traps. While searching for help the group discovers the cabin belonging to the three monstrous mountain men and are hunted down one by one. The second film introduces a larger family of cannibals: Ma, Pa, Brother and Sister. Three Finger and the Old Man are the only returning characters from the first film. This time, the cannibals hunt down a group of reality show contestants who are taking part in a survival reality show. Wrong Turn 3: Left for Dead features a group of prison officers and convicts. The returning character Three Finger causes the transport bus to crash, allowing the convicts to escape and take the surviving prison officers, Nate (Tom Frederic) and Walter (Chucky Venn) prisoner. While fleeing, the convicts and their prisoners stumble across a lost truck which had been transporting thousands of dollars, as well as Alex Miles (Janet Montgomery), who has been lost in the woods since Three Finger killed the rest of her friends. Eventually, Three Toes (Three Finger's nephew) is killed by Chavez[who?]. Three Finger finds Three Toes's severed head, which makes him furious. He creates a shrine and leaves the head on display in his cabin. The one surviving convict, Brandon, convinces Nate of his innocence, and is set free. Nate, Alex and Brandon are the only survivors. This film provides the back story to the three original killers and shows their childhood. It also shows how the three brothers and several others escaped. The story focuses on a group of nine teenagers who take a wrong turn while riding their snowmobiles looking for their cabin. They end up in an old abandoned insane asylum which is still inhabited by Three Finger, Saw Tooth and One Eye. The friends decide to spend the night in the asylum and they are attacked by the three brothers. By the end of the film, all nine teenagers are dead. It is revealed that Maynard is a serial killer who has been on the run for over thirty years, and is now in cahoots with the three cannibal brothers. He repeatedly refers to them as 'my boys' and his kin. Throughout the course of the film, the brothers attempt to break Maynard out of jail and kill off the college students and Sheriff Angela Carter (Camilla Arfwedson), while the rest of the town is at the festival. The film ends with Maynard and the three brothers escaping with the blinded Lita (Roxanne McKee) as a captive. In the sixth installment, Danny (Anthony Ilott) discovers his long lost family as he takes his friends to Hobb Springs, a Forgotten resort deep into West Virginia Hills. Danny then has to choose between his family or his friends as they are being killed by his family one by one. In October 2018, a remake based of the original film was announced is in development. The film will be written by series creator Alan B. McElroy and director Mike P. Nelson is chosen to direct. A Y indicates the actor portrayed the role of a younger version of the character. An O indicates a role as an older version of the character. A V indicates the actor or actress lent only his or her voice for his or her film character. A C indicates a cameo appearance. An A indicates an appearance through archival footage. A dark gray cell indicates the character was not in the film. The Wrong Turn film series has featured several different cannibals. All of the cannibals are hostile toward the characters they encounter, showing no remorse for their victims. The cannibals are portrayed as mute but show the ability to communicate with each other. They also show the mental capability to operate machinery and vehicles. The cannibals stay with each other in groups and appear to be the result of inbreeding. In Wrong Turn he made his first appearance alongside his two brothers, attacking the medical student, Chris Flynn and the group of friends including Jessie Burlingame, Carly Marquez, Scott, Evan, and Francine, However, in the end of the film, Three Finger manages to survive as he was last seen killing the deputy sheriff as he investigates the destroyed cabin. However, his brothers were presumably dead. In Wrong Turn 2: Dead End , he is seen killing Kimberly by cutting her in half with the help of Brother, a member of the cannibal family. Then, he and the mutant family begin their brutal assault on the rest of the contestants as he successfully killed Neil, a television crew member and captured Colonel Dale Murphy with the help of Pa. Later, he was seen torturing Dale in his cabin but Dale somehow manages to escape before engaging Three Finger in the knife fight. During the fight, Dale manages to shoot Three Finger in the chest with a shotgun and as the result, he was presumed dead, but he survives. In Wrong Turn 3: Left For Dead, he is trying to kill a group of hikers and prisoners, and he is killed at the end of the film, stabbed in the head with his hook and blown up on top of a car. In Wrong Turn 4: Bloody Beginnings the fourth installment in the franchise is an origin story of the mutant cannibals showing how they became. In Wrong Turn 5: Bloodlines he is an antagonist alongside his two original brothers. During the series, he has been blown up, stabbed, impaled, and shot various times, and yet survived; he is also very skillful at creating traps that will instantly kill the victims before he finishes his cruel job on them. In addition, he also has the unnatural ability of regenerating. In Wrong Turn 6: Last Resort he returns alongside his two original brothers. Saw Tooth, like his two brothers, first appears in Wrong Turn. He is the biggest and strongest of the family. He is killed at the end of the first film and does not appear again until the first prequel, Wrong Turn 4: Bloody Beginnings, Wrong Turn 5: Bloodlines and then Wrong Turn 6: Last Resort. First appears in Wrong Turn. Just like Saw Tooth, he dies in the first film, and does not make another appearance until the fourth, fifth and sixth film. Wrong Turn 2: Dead End introduces a family of four cannibals called Ma, Pa, Brother and Sister. The two young siblings are shown to have an incestuous relationship; Sister even gets extremely jealous and angry when she catches Brother masturbating while spying a human girl. Ma gives birth to a mutant baby before she (and the rest of her family) is killed. The second film ends with Three Finger caring for the baby. The baby becomes known as Three Toes in Wrong Turn 3: Left for Dead. Three Toes is killed by a group of convicts, and his head left as a warning. Three Finger finds Three Toes' severed head, which makes him furious. He creates a shrine and leaves the head on display in his cabin. ^ Hermanns, Grant (October 15, 2018). "Wrong Turn Remake in the Works at Constantin Film". Coming Soon. Retrieved October 16, 2018. ^ "Wrong Turn". Rotten Tomatoes. Retrieved November 9, 2018. ^ "Wrong Turn". Metacritic. Archived from the original on 2010-11-13. Retrieved November 9, 2018. ^ "Wrong Turn 2: Dead End". Rotten Tomatoes. Retrieved March 30, 2018. ^ "Wrong Turn 4: Bloody Beginnings". Rotten Tomatoes. Retrieved March 30, 2018. This page was last edited on 9 April 2019, at 21:09 (UTC).